WebSaver's Contest - Win $250 in groceries! Home » Expired » WebSaver’s Contest – Win $250 in groceries! WebSaver’s Contest – Win $250 in groceries! 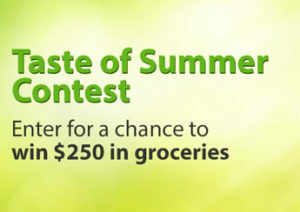 Enter webSaver’s Taste of Summer contest for your chance to win a $250 grocery gift card. All you have to do is answer a short survey and you’re automatically entered for your chance to win. 100 Free Expert Last lipsticks each day for 20 days! Play the Canada Dry Family Feud $150,000 Giveaway!